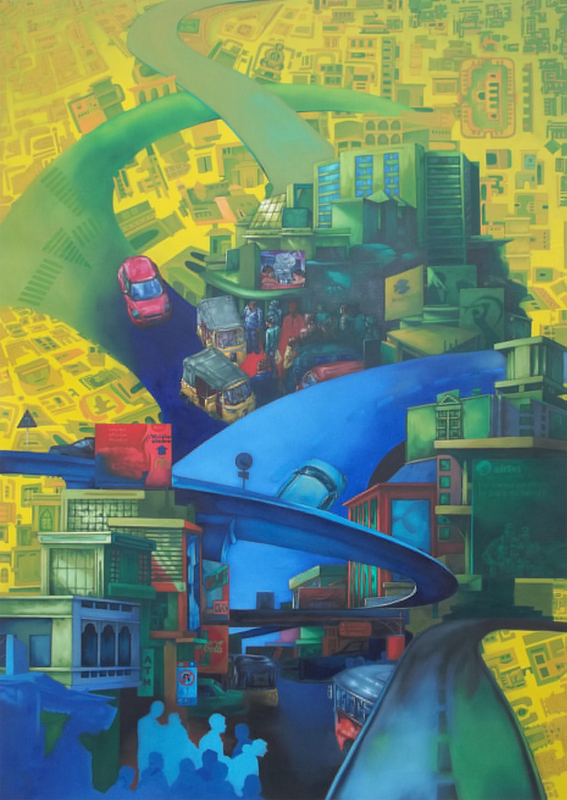 born in 1981 in West Bengal, he completed his B.V.A in Painting from the University of Burdwan in 2008, he post graduated in Painting from the University of Hyderabad in 2010. He has participated in art exhibitions all over India from 2007, which include Group show at Shangyuan art museum, Beijing, China in 2012, “morning at the window” in Galerie Mirchandani + Steinruecke. Mumbai, 2011. Group show “April Salon” in Galerie Mirchandani + Steinruecke. Mumbai, 2010. 51th National Exhibition of Art, Panaji, Goa, 2009. 2007- Final year exhibition of College Of Art And Design at Academy of fine arts, Kolkata, 2007. Participated in Golden brush Exhibition held in Birla academy of Art and Cultur, Kisnasayer art exhibition in Burdwan, West Bengal, in 2006 and In Search of my Space, Art Houz, Chennai, 2015. He was awarded the Vice~Versa Residency Fellowship at the Beijing Shangyuan Art Museum in Beijing, China, under the International Artist Exchange Program in 2012.